HostNep Network Review 2019: Is HostNep Network a Good Hosting? HostNep Network’s old-style website advertises affordable hosting plans, but it includes a lot of broken links. 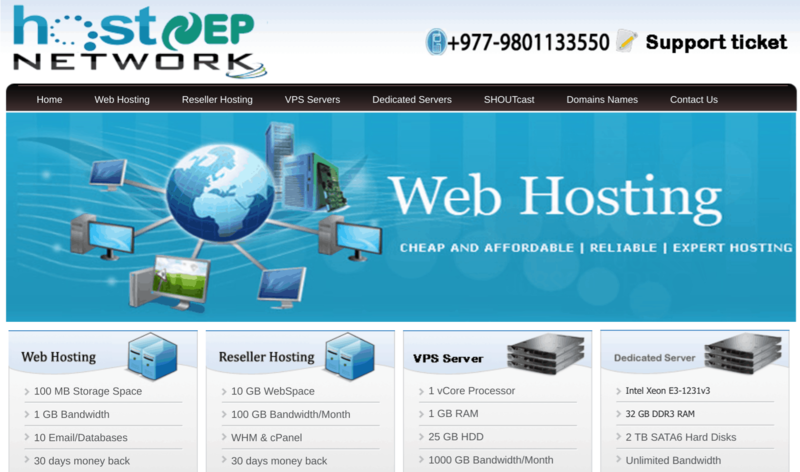 This company now seems to have handed over the baton to its more modern sister site WebHostNepal. In business since January 2011, HostNep Network (aka. Web Host Nepal) offers a range of hosting services including shared hosting, VPS, dedicated server, and SHOUTcast hosting. It has offices in Nepal and the United Kingdom, but its servers are in the United States, Canada, and Germany. HostNep targets mainly micro, small and medium enterprises (MSMEs) from its English language website. HostNep Network’s shared hosting plans come in four different flavors; W-1 to W-4. Anyone looking to host a static website with low traffic expectations can choose the lightest W-1 plan. Those with more demanding requirements should select one of the other shared plans or even a VPS or dedicated server. Customers can control their hosting from (and restore backups through) the cPanel control panel. It includes the Softaculous installer for the easy installation of web applications like WordPress and osCommerce. Beginners benefit from a website builder with over 300 templates, and experts get programming support for PHP, Perl, and Python, plus MySQL. You get SSH access with VPS plans but not with shared hosting, and VPS customers also enjoy DDoS protection with Cisco Guard. There are no backups with VPS plans, but HostNep can offer you an external backup server for an additional fee. HostNep’s shared hosting plans are reasonably priced. The VPS plans are slightly expensive for the features on offer, and you incur an additional setup fee. Both kinds of hosting can be bought (if at all) on monthly or annual terms. While there is no free trial to see how well these services stack up against the advertising, there is a 30-day money back guarantee that should get you out within the first month if the services don’t live up to your expectations. HostNep’s 24/7 customer support (according to its website) should be available via email, support ticket, and telephone. But the link to submit a support ticket is broken, and the support email address isn’t obvious. To make matters worse, the “Order Now” buttons are also broken, and there is no more hope when trying to access the knowledge base. 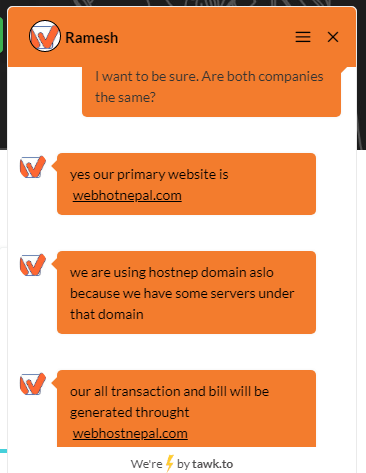 Clicking the blog link led to the WebHostNepal blog, and via a live chat, I was able to confirm that the two companies (HostNep Network and WebHostNepal) are one and the same. Since the HostNep Network website eventually led me to the WebHostNepal website via its blog, and since customer support confirmed that it’s essentially the same company, the latter might actually be the better starting point. The WebHostNepal website is more modern, and all its hyperlinks seem to work, so it appears that this provider has simply given up on maintaining the website on its old HostNep domain. For HostNep Network’s affordable hosting, head instead to its sister site WebHostNepal. Wondering how HostNep Network stacks up against other Web Hosting companies? Enter any other Web Hosting company and we will give you a side-by-side comparison.